When Somalia's president was overthrown in 1991, much of the country fell under the control of warlords and clan-based factions. Sixteen years later, and with the backing of Ethiopian troops, the current interim administration is the 14th attempt to try to bring stability to the country. Mogadishu International Airport has not been used much over the last 10 years, but let us just imagine what it is like, flying in. The plane approaches from the south, descending quickly over the Indian Ocean. The end of the runway juts out towards the sea, and it is hard to get a glimpse of much more than the large red sand dunes and the turquoise-coloured water breaking on the rocks. At first glance, it can look like a tropical paradise. But Mogadishu has never been for the faint-hearted. Since 1991, when an ageing dictator by the name of General Mohamed Siad Barre was overthrown, Somalia has been one of the most dangerous places on earth. A few months after Siad Barre fled, I was in Mogadishu talking to a friend, a Somali doctor, Hussein Mursal, who worked for a British relief agency. Clan fighting had broken out in the city. Members of Mursal's own family had been shot and wounded at one stage when looters came to the house to pillage. I asked Mursal how long he thought the conflict might last. Would it be weeks or months ? "Oh no," he said..."they're going to be locked into this for years to come." This past fortnight, I have thought a lot about Somalia, as the news has filtered out. First, the confirmation that Ethiopian troops were inside the country, in support of Somalia's fledgling transitional government. Then the announcement that the Union of Islamic Courts and its militia had abandoned Mogadishu with even more haste than Siad Barre did 16 years ago this month. These past few days, the Islamists have been on the run, boxed in against the Kenyan border in the south, pursued by the Ethiopians with their tanks and airpower, blocked by an American warship offshore, and probably monitored from above, by American satellites. This could be the end of the Islamists, or more ominously, it could herald the start of a Taleban-style guerrilla war. It has become a cliche to say that "the troubles in Somalia threaten to spill over into the rest of the Horn of Africa", but Ethiopia has quietly meddled in Somalia for years, and now the visible presence of the Ethiopians is both provocative and dangerous. Foreign forces are not welcome. The Ethiopians know this, but they are also deeply fearful of an Islamist threat from within Somalia, and are determined to crush it. And so far, the Ethiopians are pretty pleased with themselves. As a darling of the West, Ethiopia's Prime Minister Meles Zenawi has been able to get away with brutally putting down internal dissent in his own country, and now moving thousands of troops into Somalia. 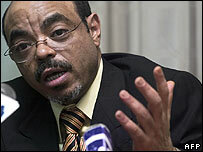 A warmonger he may be, but Mr Meles is on the side of President Bush and Tony Blair in the "war on terror", and he is the most important leader in a rough neighbourhood. So the Ethiopians are trying to fill the power vacuum in Mogadishu, for while the Somali government has international recognition, it has little power. Somalia's warlords will no doubt see this as a new window of opportunity for they have not gone away. 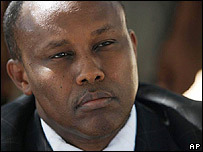 In fact, some of them are members of the transitional government, including Hussein Aidid. 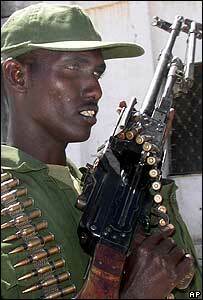 He came to Somalia as an American Marine in 1993. When the Americans left after the ill-fated "Black Hawk Down" episode in which 18 US soldiers were killed after the downing of two American helicopters, Hussein Aidid stayed on, and became a powerful faction leader. It was his father, the late General Mohamed Farah Aidid who controlled large parts of Mogadishu in the early 1990s and whom the United States tried, in vain, to capture. I met General Aidid when he was at the height of his power. I always found him a little deranged and out of touch with reality. But he was certainly a man to be feared. I remember walking across the road one afternoon from the house where I was staying. Just as you might lean across the garden fence to talk to your neighbour, I wandered into the driveway opposite for a chat with some of Aidid's fighters. Astonishingly, they were busy welding a missile pod from a MiG fighter jet on to the back of a jeep, one of the so-called "technicals". Within minutes, they had loaded it with rockets, and test-fired a couple of them which fizzed over the nearby rooftops and disappeared out to sea. I mention all this because what strikes me most about the recent events in Somalia is how little anything has changed. In 1991, hopes of a brighter future faded quicker than the slogans that were daubed on the streets to celebrate the overthrow of the old dictatorship. Now, as then, Somalia is starting from scratch.